Cetaphil Normal to Oily Skin Daily Facial Cleanser. Our product removes excess oil without drying.This effective yet gentle facial cleanser was originally formulated for dermatologists to keep normal to oily skin clean and healthy. By using this product it removes surface oils, dirt and makeup without leaving skin tight or overly dry. Our product is gentle enough for everyday use. Cetaphil Normal to Oily Skin Daily Facial Cleanser. Cetaphil Daily Facial Cleanser For Normal to Oily Skin. Removes excess oil without drying. This effective yet gentle facial cleanser was originally formulated for dermatologists to keep normal to oily skin clean and healthy. Removes surface oils, dirt and makeup without leaving skin tight or overly dry. Rinses clean without leaving any pore-clogging residue. The makers of Cetaphil do not manufacture store brands. Ingredients: Water, Sodium Lauroyl Sarcosinate, Acrylates/Steareth-20 Methacrylate Copolymer, Glycerin, PEG-200 Hydrogenated Glyceryl Palmate, Sodium Laureth Sulfate, Butylene Glycol, PEG-7 Glyceryl Cocoate, Phenoxyethanol, Masking Fragrance, Panthenol, PEG-60 Hydrogenated Castor Oil, Disodium EDTA, Methylparaben. Instructions: Massage a small amount onto wet skin. Rinse. 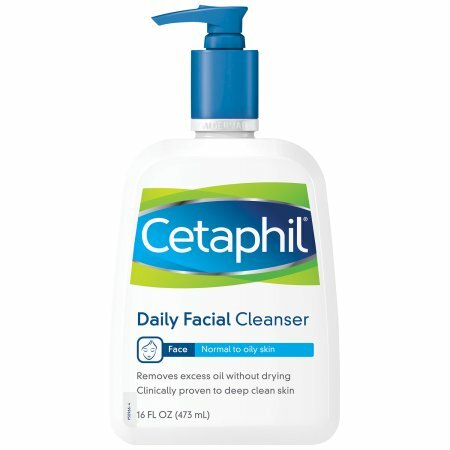 CETAPHIL DAILY FACIAL CLEANSER 16OZ by GALDERMA LABS,INC.